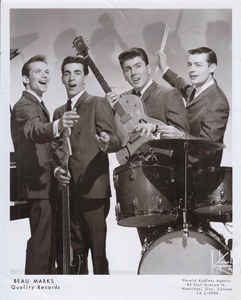 Originally named the Del Tones when they formed in Montreal in 1958, the groups’ first single, called “Moonlight Party”, climbed to #1 in Montreal in May 1959. However, there were other bands with the same name. The Deltones had a single on Vee-Jay Records that was a minor hit in Chicago. That group had a minor hit in Philadelphia on another label in 1960 called “Strollin’ the Blues”. There was also a band from Australia called the Delltones. To avoid confusion, the Del Tones from Montreal changed their name to the Beau-Marks in 1959 in response to a political controversy. Their new name was a pun on the Bomarc, the worlds first supersonic long-range, anti-aircraft missile, developed by Boeing. The development of the Bomarc missile was accompanied by problems with its propulsion system. In 1958 the Conservative Government, led by Prime Minister John Diefenbaker, was faced with two strategies for Canadian air defense. One was to produce the Avro Arrow, a very fast missile at a cost of over 12 Million per aircraft. It was created by the Canadian company, Avro Canada. The other option was to purchase Bomarc missles made by Boeing in Seattle, Washington, for 2 Million. The later missiles would be tipped with nuclear warheads. However, the Conservatives opted eventually not to have nuclear tipped missiles in Canada. With the cancellation of the Avro Arrow, the company lost over 14,000 jobs. As the missile controversy swirled in the halls of the Canadian Parliament, the Beau-Marks had fun with their version of the missile’s name. Their debut album, The High Flying Beau-Marks, had the Beau-Marks wearing red and blue plaid suit jackets, white collared shirts, black ties and navy blue pants. Smiling in the sun, they stood and squatted on a tarmac in front of a jet plane. The Beau-Marks were comprised of lead vocalist and guitarist Raymond “Ray” Hutchinson, bass and guitar player Michel “Mike” Robitaille, pianist Joseph “Joey” Frechette and drummer Gilles Tailleur. Born in Montreal, in 1940, as a child, Ray Hutchinson had tuberculosis for twelve years. He got better and at the age of seventeen was writing and performing “Moonlight Party,” that became the Del Tones first hit, prior to the group’s name change. Two of the Beau Marks, guitarist and vocalist Ray Hutchinson, and bass player Mike Robitaille, were polio victims. They met at a school for handicapped children in Montreal. 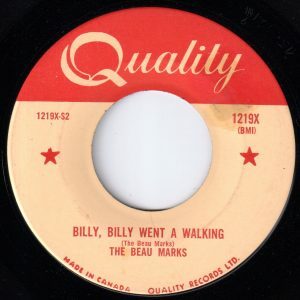 The Beau Marks debut album contained a dozen tracks, five of which would be released on 45 RPM singles. The first four of these were “Clap Your Hands,” “‘Cause We’re In Love”, “Billy, Billy Went A Walking” and “Oh Joan” released through 1960. “Moonlight Party”, which was released as a single in 1959 by the Del Tones, also was a track on The High Flying Beau-Marks. The group recorded and paid for all their recordings. They also wrote all their songs. Initially, they released “Clap Your Hands” without any hand clappers on the recording. Gary Copeland, who knew the group when they recorded in the studio recalls the went on to market “they were finished, but they had some studio time left. Ray suggested to Joey that they record the Clap your Hands Song, but Joey said that nobody would like it. Well, Ray won and the rest is history.” They recorded the record twice, the second time they added hand clapping. It was the response to “Clap Your Hands” that got the quartet bookings in both Manhattan’s Carnegie Hall and Peppermint Lounge’s as well as on American Bandstand. They also were among the first Canadian groups to appear on the Ed Sullivan Show. (The Four Lads had performed a number of times on the Ed Sullivan Show, including on July 11, 1954. And The Crew Cuts had been on Ed Sullivan’s Toast Of The Town on December 12, 1954). “Clap Your Hands” climbed to #1 in Australia for four weeks in August 1960. In the USA “Clap Your Hands” peaked at #45 on the Billboard Hot 100 and #40 on the Cashbox Top 100 Singles chart. Each article posted on Vancouver Signature Sounds involves research into the chart runs on the Billboard Hot 100 and the chart runs on the local radio stations in Vancouver, and selected radio markets of interest elsewhere. However, I don’t typically include that data in the “References” section below. On my “Resources” page on this website, readers can access links to the Billboard archives and Vancouver Top 40 Radio.com, where most of the weekly charts for CKWX, CFUN and CKLG between 1958 and 1969 can be viewed. However, in the case of “Clap Your Hands”, there is a lot of misinformation online about how well this song did on the national charts in the USA and in Canada. Numbers of online sites claim the song peaked at #1 in the USA, or #15. But it’s best chart run was for 15 weeks on Cashbox where it peaked at #40. And in Canada the song was not a #1 hit in the nation. It peaked on 1050 CHUM-AM in Toronto at #14, and also at #14 on CFUN in Vancouver. On CJAD in Montreal, “Clap Your Hands” climbed to #21. It made the Top Ten in Calgary, but access to complete chart information on 960 CFAC radio in Calgary is not available online. The second single from The High Flying Beau-Marks was “Billy, Billy Went A Walking”. “Billy, Billy Went A Walking” is a song about a guy who goes for a long walk after having an argument with his girlfriend. She doesn’t think his love is real. He’s going for a walk to try to think through some way to convince her he loves her. However, if his next attempt to demonstrate his love results in her throwing him out the door, he’s resolved to walk away from the relationship. Likely she won’t actually pick him up and throw him out the door, but show him the way out the door. In any case, Billy was in a dating relationship that was on the rocks. The final line was predictive: “now he’s walking away.” I wonder how many listeners at the time imagined that the couple would stay together? The song peaked at #4 in Vancouver, #10 in Honolulu, #13 in Seattle and #44 in Toronto. The Beau Marks second album had no hit singles. However, their third album, The Beau Marks, included five single releases. (The spelling in the album created some ongoing confusion regarding whether or not to include a hyphen in the group’s name). The first single release from this album was “Classmate”. It was ready for the record buying public in June 1961. From The Beau Marks album, there were other single releases. “Yours” climbed to #18 in Vancouver in October 1961. “Little Miss Twist” saw the group trying to cash in on the twist craze, and it climbed to #15 in Vancouver in January 1962. The 1930’s standard, “Summertime” was a B-side to the commercial failure, “Clap Your Hands Once Again”, in April 1962. A final single release from their self-titled third album was “The Tender Years”. Though the song didn’t chart in Vancouver, it made the Top 20 on CHUM in Toronto in the summer of ’62. At the peak of their popularity in 1960, the Beau Marks appeared on American Bandstand and the CFTO (Toronto) show Hi-Time. They also did some touring in the USA which included a gig at Carnegie Hall in New York City. After releasing their three albums in the early sixties the group split coinciding with the British Invasion. In 1963 Ray Hutchinson joined Dave Nichol and The Coins. Eventually Hutchinson became a lounge act, as well as owning a restaurant in Montreal called Le Sentiment where he also performed. Gilles Tailleur lost his life at the age of 35 from a cerebral hemorrhage. Mike Robitaille went on build a career in video production. Lastly, Joey Frechette became the CEO of Capitol Records’ April Blackwood publishing. From there he moved on to work as a program director at CHOO radio in Ajax, Ontario. He released his own version of “Clap Your Hands” in 1987 billing himself as Joey Conrad. Ray Hutchinson bio, Ray Hutchinson.tripod.com. Don McBrearty, The Arrow, Tapestry Pictures/CBC, 1996. Cashbox Top 100 Singles, July 2, 1960, Cashbox Magazine, USA. Number One Singles of 1960 (Canada), CHUM charts, Wikipedia.org. C-FUN-Tastic-50, CFUN 1410 AM, Vancouver, BC, November 26, 1960. Rick Jackson. Encyclopedia of Canadian Rock, Pop and Folk Music. Quarry Press, 1994. Email from local music reporter, Richard Skelly, January 30, 2019.